I know it's a little late for 2017 resolutions, but I also firmly believe that it's never an inappropriate time to resolve to better yourself. I'm making these resolutions at the start of a new chapter of my life, which has given me the space to really reflect on myself and my life and decide what I want to do with it. I made this post extremely personal on purpose. Being vulnerable, especially on the internet, can be nerve-wracking. When you open up, you run the risk of being ridiculed, misunderstood, or even outcast. However, I believe that vulnerability is essential in creating a society in which people are comfortable with themselves and not judgemental of others. By being honest about my flaws and insecurities, I hope to reassure others with the same self-perception that they are not alone or unlovable. 1. Wash away my heartbreak. Bathe myself in non-romantic love. This is the big one. I went through a breakup 7 months ago, and still find myself bitter/angry/sad/thinking about it on a daily basis. It's time for me to learn what I can from this experience and move on from it. To do so, I'm going to focus on the love that is in my life instead of getting stuck on what I've lost. I have amazing friends and family, I love my new job, I've been dreaming of moving to New York since I was little, and I have the best dog ever. The universe is full of non-romantic love for me to embrace, and I plan to do so. 2. Ease up on the lectures. This is a habit I've developed as a result of being the mom friend/older sister and an academic. In the middle of a conversation, I find myself presenting facts like an essay or preaching values to someone who already knows these facts or agrees with my values. I want to have two-sided conversations with equal opportunity to share and learn, which can't happen when I'm lecturing my conversation partner. 3. Open the door for others. I've noticed that I almost exclusively walk through the door first without holding it open for others. I know I appreciate when someone holds the door for me; it's time I start doing the same for others. 4. Go to Fashion Week. 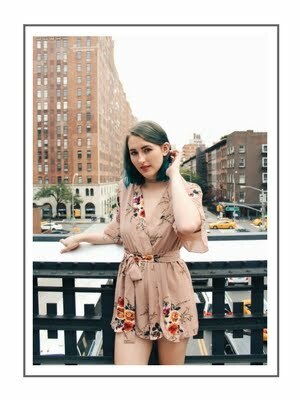 I live in New York, I run a style blog, and I've been wanting to go since I was in elementary school: it's time. 5. Be comfortable keeping things to myself. This is another habit I've developed that prevents me from having two-sided conversations. In many instances, I find myself searching for a way to turn the conversation to me. Sometimes it's in an attempt to empathize, but mostly it's because I feel this burning desire to share and be validated. I would like to become more comfortable validating myself so that I'm not constantly unintentionally oversharing and alienating people. 6. Leave the country. I've been traveling my whole life, but 2016 was the first year in as long as I can remember that I never left America. I want to continue to travel the world in 2017.